If you search for a purpose for staying fit, then this might be your thing! 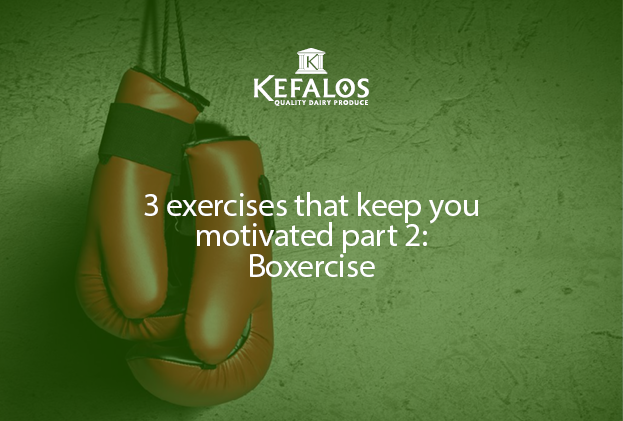 Boxing is an all round workout that involves punches, combos, blocking, footwork as well as other cardio activities such as running and jump roping. Apart from providing you with a full body workout that is guaranteed to get your heart pumping and KGs fleeing, boxing also develops you mentally. The motivation comes as soon as you set your foot in the ring. It’s mindfullness at its best – you will not be able to think about anything else for that hour, and as your body starts to transform and your conditioning improves, you really start to feel like a prizefighter getting ready for Vegas. Your mindset evolves into a boxer’s and your training influences everything else you do: You eat to train better, you sleep to train better, you develop discipline to train better. And it’s really not called the sweet science for nothing. Once you get over the initial steps of learning the basic combos, it’s the technical aspect that comes next that allows you to start seeing results. Feel your whole body burn and sweat as you enjoy throwing a series of intense combinations: Remembering to twist your body to the right angle when you throw the perfect hook, or ensuring you bob and weave as you duck really get’s the whole body going. You can enjoy boxing with a trainer or in a group setting with a class. Body Active Gym has one of the biggest classes in Harare. Allie, the trainer, has been boxing since he was a kid and trains the likes of Manyuchi and other local fighters. He trains men and women aged 18-60, so there is a program for you as well. We were lucky enough to be invited to a training sesion with Allie during his Wednesday classes at Body Active gym. The full class lasted one hour. Each station had a 15-minute intense session, with the additional 15 minutes being allocated for breaks and moving between stations. The bags get you to focus on your rhythm and timing, the stairs help you improve your cardio and conditioning, and the studio helps with developing your technique and strengthening other muscle groups like your abs. The whole experience was worth it. Out of all the stations we enjoyed the stairs the most (crazy right). The reason being they required the most mental strength to get through. Just looking at them and then hearing what we had to do was enough to put us off even trying. However, with each cycle we found them becoming easier and easier to the point where the 15 minutes flew by. In that short space of time it was easy to see how through persistence and discipline you could turn this into an art. Our biggest take away during the whole session was pacing. The key to having a great session is to not go full Mike Tyson but rather pick a pace you can move at from start to finish. Allie says, “boxing is a 48 minute match in which you need all your strength and energy. There’s no point in having a great first round only to get knocked out in the second”. Those words are central to the discipline and skill required to improve as a boxer. Move at the pace you can most improve. There you have it, a short guide to the world of boxercise. If you would like to join in on the Wednesday class you will need to be a member of Body Active gym. If you would like to get in touch with Allie to get a private session you are welcome to call him or Whatsapp him on 0772694405. He conducts all his private lessons at the Borrowdale racecourse. 10 things you didn’t know about milk →← How to make every date fun and exciting!